Method Man is the easy standout, proving to be the most memorable piece of a film that embraces its slightness to warm hearts and lets the rest come what may. The core story hook may be preposterous, but what best resonates in "The Cobbler" are its human slice-of-life elements and the big-city, blue-collar milieu in which it is set. Adam Sandler stars in a watchable movie so, yes, there's a miracle involved. 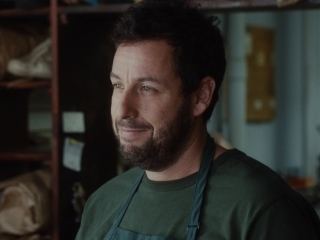 Sandler tamps down the moron act to play Max Simkin, a Bronx cobbler with a magical stitching machine that enables him to transform into his customers by slipping on their shoes. It revives the pleasant art of storytelling most of today's young filmmakers have all but abandoned, and cures (temporarily, anyway) my allergy to Adam Sandler. It manages to turn a potentially charming piece of contemporary magic realism into a tedious and clunkily episodic mess that, with its lazy racism and unnecessary violence, is rarely fun to watch. It's mostly just boring, and then toward the end it's actually confounding. You don't want to be in Adam Sandler's shoes right now. Throughout the film's 99 minutes you will find yourself wondering whether this is a genuine black comedy, a family comedy, a dramedy, a cheap-shot drama, or possibly a melodramatic modern-day superhero story about being a good Samaritan. The quirky magic-realist conceit has great potential but co-writer/director Tom McCarthy fails to bring it to a shine. The problem with this movie, like so many Sandler films, is that it tries to be a heartwarming tale while at the same time being offensive. The Cobbler is startlingly thin and naive, especially in regard to the larger implications of its hero's actions. The Cobbler is the rare movie so terrible that it's hard to figure out why it even exists, why somebody didn't run in front of the speeding train of its production yelling, "Stop!" A strange departure into slapstick renders any genuine sentiment null and void and the balance between comedy and drama is just never properly gaged. Proves too high-concept for the indie sensibilities of writer/director Thomas McCarthy. Much play is made on "sole" and "soul", and Sandler looks depressed throughout. Fine - let it be him for a change. Sandler had an opportunity to explore ethnicity, family and morality. He botches the whole thing. It's difficult to believe this sentimental pudding is written and directed by Thomas McCarthy, who was behind the genuinely touching The Station Agent and The Visitor and wrote the script for Pixar's Up.